The day started off with an unexpected treat. Mike was doing his morning stretches on the living room floor and concentrating intently on counting “one one thousand, two one thousand, three one thousand,” so I was able to sneak up behind his head and lick his nose for several seconds before he figured out what was going on. Call me the real downward dog. My day got even better in the early afternoon when Heather took me on a field trip to the Village, where we walked around a little and visited the office of Caroline, my personal financial adviser and sometime hotelier. My portfolio may be down these days, but Caroline always keeps lots of treats in her desk, anyway. I picked up my shares. Then, just after Heather and I got home from the Village, what came rolling down our street? A big brown truck and my favorite UPS delivery person, Donna. More treats ensued, even though the delivery was not for us. I must remind Heather to give Donna another big box of biscuits before Christmas to keep priming the pump. My late-afternoon walk with Heather and Mike was shorter than normal because Heather was hustling us home to greet an expected visitor. I figured it would be Charlie, so I was surprised and thrilled to see it was Lynn, my other pal and favorite dog sitter of all time (that is, most generous with the treats and cuddles). I was so happy to see Lynn that she could barely make it into the house because of my jumping. When she finally managed to sit down on the couch, I leaped onto her lap and showered her with kisses. After my initial excitement subsided, we had a nice, long cuddle while she was talking to Heather and Mike. It was great to see her again, because nobody understands me and speaks my language like Lynn does. Oh, and she always comes with a whole bag of treats, too. High-quality treats. I suspected that Mike cut my dinner ration that evening because of the many extra treats I scarfed up all day, but I did not complain. My nose told me Heather had prepared her specialty dish, shepherd’s pie, and I would likely be getting several plates, pots and bowls to lick after their dinner. Yes, it was a red-letter day, morn ’til night. Mike takes me for a long walk every afternoon, and most days go into the park . I generally like to follow the same script every time. I sniff everything in sight between home and the parade grounds, then hustle along past the giant soccer ball to Chloë’s Lane, where we play fetch for about 20 minutes. Then we make a wide circuit of the bluffs and meadows, pausing on the way home for another search for food scraps by the park entrance and a flop on the corner lawn across the street. Unless I break away to chase rabbits and get caught in a blackberry thicket, that’s what we do every day. Mike might like to have more variety, but I love my routines. Every once in a while, however, something different happens. I’m usually OK with dogs that we meet on the trail or the parade ground, when I can see them coming. But when I get surprised, I get very defensive and start barking. And I can get territorial when defending my turf along Chloë’s Lane.But when the goldendoodle Toby showed up the other day, I could sense he was lost, so I let him hang. Mike used some treats to lure him back towards the Headquarters Building, and sure enough, a women was striding down the pavement with leash in hand, calling out his name. Toby and his owner were both very relieved and grateful that I had guided him back. Tightrope walker traverses the parade ground. We’ve seen the tightrope guy do his thing above the parade ground several times. The most recent time a few weeks ago he brought a small entourage along to watch, but they must have left disappointed when he bailed about halfway across. Even so, my feet still hurt just thinking about it. But the best thing that happened on a walk lately took place just outside the park, across the street on the small patch of grass between the sidewalk and the roadway. One day a small fish was lying on the grass there. Mike saw it first, and wisely steered me to the other side of the intersection before my nose discovered it. Although it was only the size of something you’d see in a fish tank, that’s not where it came from. Mike figured it was a small bait fish that a bird had scarfed up down by Puget Sound and later dropped for some reason, such as being attacked by a larger bird. It just happened to land on Chloë’s favorite corner, where Mike let it stay, expecting another bird or a raccoon would find it and haul it away. By the time we returned from our walk in the park the next afternoon, Mike had forgotten all about it. Needless to say, I hadn’t. I grabbed it and ate it with quick, forceful bites and thought, “yum and um.” Mike had the satisfaction of seeing the look on hs child’s face when she catches her first fish. Worth every penny. I really miss going to Heather’s office. I used to go all the time, until earlier this year the office changed locations, and the new landlord put the kibosh on dogs at the office. Everybody was always so nice to me there. I got lots of attention, lots of treats, and of course lots of meetings to sit through. It was fun! Frankly, I’d like to start a movement on my blog to re-institute a “dogs welcome” policy at Heather’s office, but I won’t do it because I know Heather wouldn’t approve, and that’s putting it mildly. I’m not going to risk getting into her doghouse. So what do you think? The coloring is close, and look at those bald ears! If the little girl in the picture didn’t have those light brown paws and muzzle, she and I could be twins. I can’t wait to tell my brothers Frank and Stanley about this. Maybe we have a long-lost sister who became a famous model. Mike contacted the restaurant and found out the wirehair dachshund portrait (“Mavis”) was painted by Judy North, a celebrated artist whose dog portraits hang throughout the dining areas. While Ms. North accepts commissions, Mike told me he has no interest in launching a Kickstarter campaign to raise funds for my sitting. Frankly, I don’t really care whether I get a fancy portrait or not. All I ask is that next time somebody thinks of me at dinner, send me a doggie bag, not a photo. Mike was holding out on me. 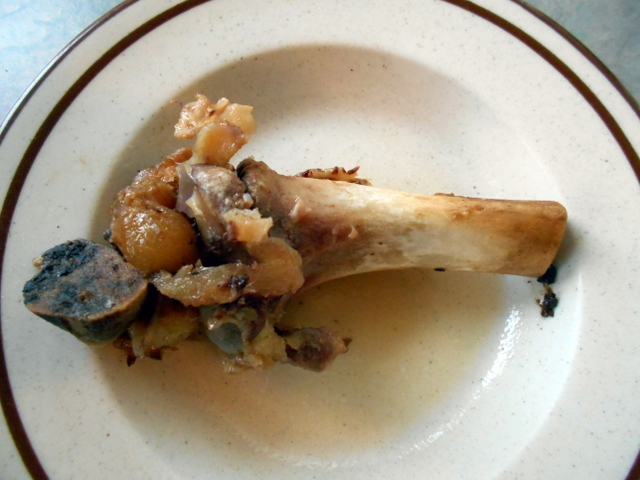 Way back in February, my aunts Susie and Debby sent me a present from Syracuse: a huge pork shank they saved from restaurant leftovers. They froze it, packed it in plastic, and sent it to me with Mike and Heather when they were there in February. Mike promptly put it in our kitchen freezer and forgot about it until last weekend, when he finally decided to let me have it. And yes, it was worth the wait, and even worth the painful boney nuggets I pooped out the next day. I mean, take a look at this bone! 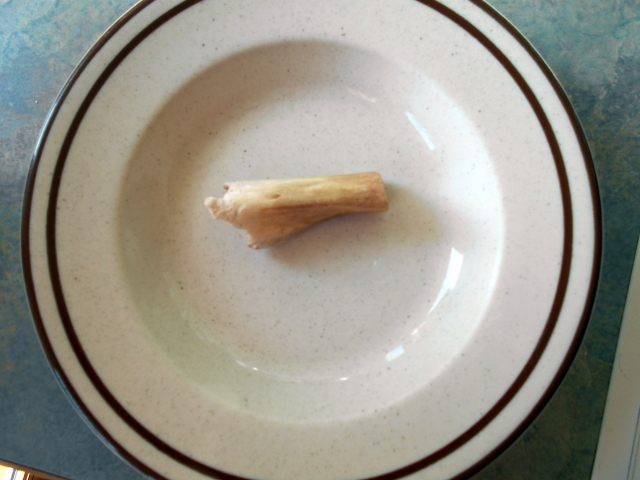 Mike must have felt bad about depriving me all those weeks, because he warmed the bone in the microwave for me. 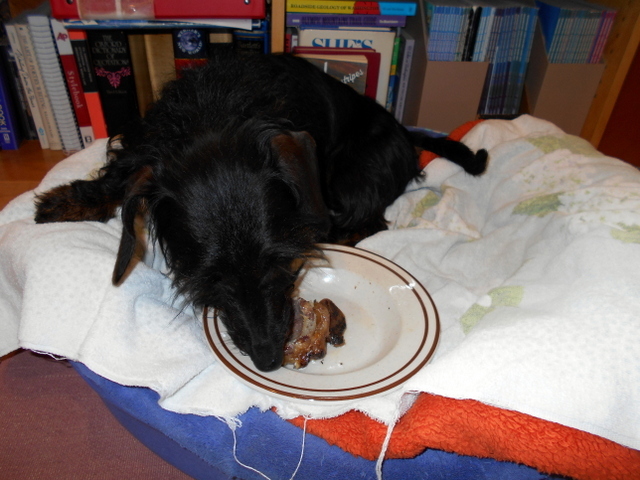 Lest I get messy, he spread an additional towel across my office bed as a tablecloth, and then he told me to get into the bed and had the bone delivered to me on a silver platter. Well, a platter, anyway. Since Heather was home working at the computer that day, it was her responsibility to monitor my activity with the bone, so I wouldn’t get any big pieces caught in my throat on the way down, or chew it until it barely existed anymore. Looking back at it now, I guess Heather didn’t do that great a job, did she? On the other hand, I didn’t choke on anything, and I can be quite vicious when I have a bone in my mouth. Here’s what was left. I heard that Mike is heading back to Syracuse again soon. 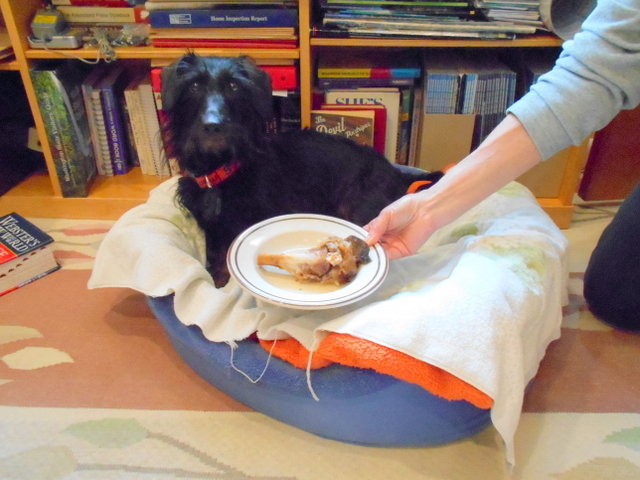 If he fails to return with at least another bone to match this one, I’ll be having a bone to pick with him.